Carrots are one of the most common vegetables in the kitchen and one of the most fundamental ingredients in the culinary arts. Easily one of the most versatile vegetables, carrots can be blanched, steamed, sautéed, roasted—or eaten raw. They're also an important flavoring ingredient for stocks, sauces, and soups. Carrots are a root vegetable, belonging to the broadly defined category of tubers—which also includes parsnips, radishes, beets, turnips, and others. How Many Types of Carrots Are There? Carrots can be bred in any number of colors ranging from white and yellow to very dark purple. But the most common color of carrot is bright orange. Carrots can also vary by shape. The most common carrots are relatively long and taper to a point. Other types are more cylindrical and can be very short and stubby. Some varieties are nearly round. True baby carrots are so named because they've been harvested early. These young carrots are small and tender and generally don't need to be peeled—a good rinse should be sufficient. But these young carrots are not to be confused with the so-called "baby" carrots that come packaged in bags. These are simply ordinary carrots that start out misshapen or have other cosmetic defects and are simply carved down into smaller, more uniform specimens. The longer carrots continue to grow before harvesting, the more they mature and develop a woody texture. These older carrots should be peeled before using them. Older carrots are also good to use for mirepoix when making stock. What's the Best Way of Cooking Carrots? 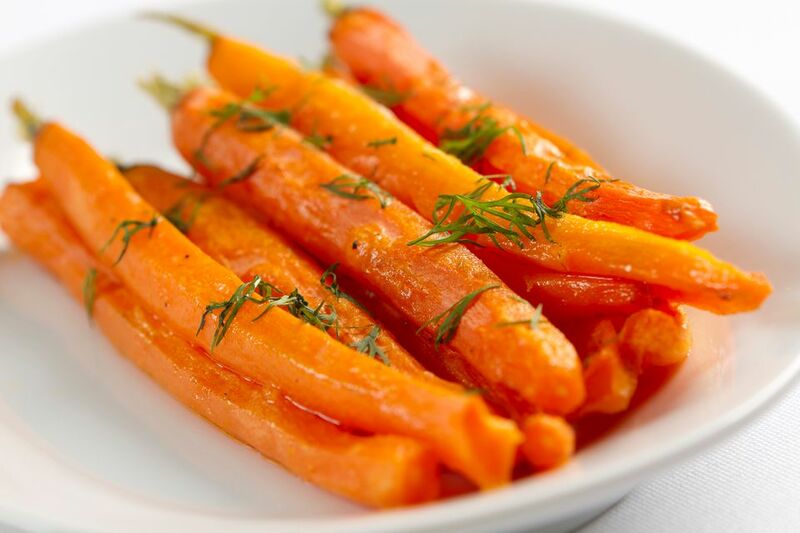 Younger carrots should be cooked quickly, with high heat, preferably in small batches. Steaming or sautéeing are ideal cooking methods for preparing younger carrots. Older carrots, which are tougher and woodier, can be braised or puréed, and are also good for making soups, stews, and sauces. When properly cooked, carrots should remain bright orange, though their color can fade somewhat when overcooked. Overcooking can also cause nutrient loss. Is It Easy to Roast Carrots? Roasting is an excellent way to cook carrots, as the high temperatures help to caramelize the sugars in the carrots and develop other compounds that produce more complex flavors. When roasting carrots, they combine well with other root vegetables such as parsnips and turnips, as well as potatoes, onions, and garlic. Simply peel, cut into bite-size pieces, toss with olive oil, season with Kosher salt and roast at 450 F for about half an hour. And see below for suggestions for other complementary flavor pairings. How Does Cooking Affect Carrot Color? Unlike green vegetables, carrots are largely immune to color changes that occur from cooking in a liquid with high acid content. That's because their orange pigment (which is also found in corn, tomatoes, and red peppers) is fairly stable. What Foods Go Well With Carrots? Carrots combine nicely with orange juice, ginger, butter, parsley, dill, fennel, tarragon, coriander, mint and nutmeg, as well as peas, celery, and zucchini.